Enjoy interactive close-up magic inside the private dining rooms of the award-winning Christner's family restaurant. Come and be amazed by Kostya Kimlat's team of magicians for the Orlando Magic and the Dr. Phillips Center for the Performing Arts. Known as See Magic Live, these incredible entertainers invite you to join them for a 2-hour "show experience." Inside the various private dining rooms of Christner's restaurant, you'll experience unforgettable magic presented by these incredible performers: Meraux Dantes, Dave Maldo, Darren Rockwell, Joshua Arroyo, Sebastian Midtvaage & Jimmy Ichihana. Looking for an amazing show with dinner? 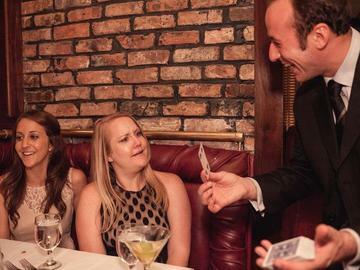 Come to the 7pm show and enjoy a four-course meal and an 80+ minute magic show in three parts, presented by the sleight-of-hand expert who fooled Penn & Teller on their national TV show and the CEO of See Magic Live, Kostya Kimlat. This year's Orlando Magic Mansion is an intimate, unforgettable experience you will treasure for a long to come. Get your tickets today and bring your friends and family!